I wanted to challenge my older students to some STEM stations that would lead into our FOSS Levers and Pulleys Unit. I came up with two great ways for for 5th graders to test their engineering skills using St. Patrick's Day themes the pulley and the conveyor belt. I did the conveyor belt lesson today because I won't see these kiddos next week because they are off to our school forest. The kids loved it. We followed up with what is a conveyor belt? They now were able to come up with a list that helped them make sense of what they were going to build. Pizza ovens at Dominoes, the grocery store check out, the airport flat transporter (love that one...they didn't have a name for it...it is actually called a moving walkway), and my favorite at the beer tour we took were a few of my favorites! I then showed them several quick videos that helped them see their examples in action. I then gave them time and tools to build a conveyor belt. First...they designed...then executed. Many had to modify and adjust. Then, we finally shared! They turned out awesome! Here is a quick movie to show you our final products! Amazing team work and collaboration! 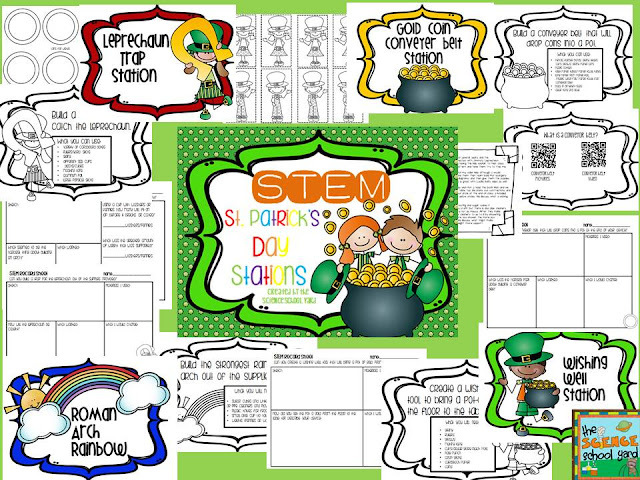 Here is the pack if you are interested in St. Patrick's Day STEM fun! Find it at my TPT store HERE.